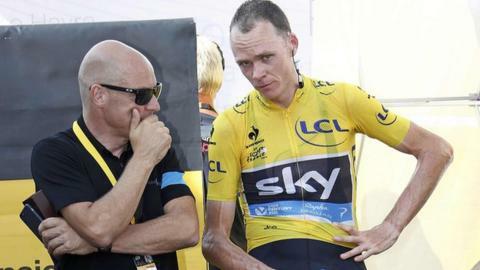 Team Sky principal Sir Dave Brailsford wants cycling's governing body to embed anti-doping officials into teams to help prove riders are clean. The British outfit's rider Chris Froome is leading the Tour de France but had urine thrown at him during a stage after accusations that he is doping. "It is not possible to prove a negative. I can't," Brailsford told French television. "But I can work with the UCI, independent experts." Brailsford was speaking after a doctor of physiology questioned Froome's dominant win at La Pierre-Saint-Martin last Tuesday on the French TV channel. Team Sky believe their computers have been hacked by critics convinced that Froome is using performance-enhancing drugs. The Kenya-born rider, who won the 2013 Tour, said on Tuesday he is racing clean but understood questions because of the history of the sport. "I understand people asking 'do we believe in Chris Froome? '," added Brailsford. "How can we find a test where we say 'we are clean'? We have responsibility to be transparent. "I would like the UCI to invest in individuals and put them into each team 24/7. That would prove we do nothing. I'm ready to do it." He added: "It is not fair what has been said. Chris is special. He has a special physiology. But he doesn't cheat." Froome is leading from Colombian Nairo Quintana by three minutes 10 seconds with a week to go. He again defended himself on Sunday as he reiterated he was riding clean. "Times have changed. Everyone knows that," said Froome. "This isn't the Wild West that it was 10, 15 years ago. "Of course there are still going to be riders who take risks (with performance-enhancing drugs) in this day and age, but they are the minority. It was the other way round 10, 15 years ago. French newspapers, radio shows and TV programmes have openly questioned whether Froome is clean, usually citing his poor early record in Grand Tours as evidence and the US Postal-like control of the race that Team Sky has exerted - US Postal being Lance Armstrong's team. The fact that some of this "debate" is being generated by former dopers-turned-Tour pundits, such as Laurent Jalabert and Michael Rasmussen, has not raised the eyebrows it should. Team Sky are furious about this, blaming this commentary for creating the increasingly poisonous atmosphere.